You'll visit kid-friendly attractions like Nature & Wildlife Tours and Vietnam National Museum of Nature. On the 20th (Mon), spend an adventurous day with a kayaking and canoeing tour. The adventure continues: wander the streets of Old Quarter, get engrossed in the history at Vietnam Museum of Ethnology, explore the activities along West Lake, and indulge in some culinary diversions at a local gastronomic tour. To see maps, other places to visit, ratings, and more tourist information, read our Hanoi visit website . Reykjavik, Iceland to Hanoi is an approximately 22.5-hour flight. The time zone difference when traveling from Reykjavik to Hanoi is 7 hours. Wrap up your sightseeing on the 23rd (Thu) early enough to drive to Ninh Binh. Family-friendly places like Nature & Wildlife Tours and Van Long Nature Reserve will thrill your kids. There's lots more to do: contemplate the waterfront views at Trang An Grottoes, hunt for treasures at Rong Market Ninh Binh, don't miss a visit to Trang An Landscape Complex, and explore the fascinating underground world of Mua Caves. For maps, photos, reviews, and tourist information, use the Ninh Binh tour itinerary planner . Traveling by car from Hanoi to Ninh Binh takes 1.5 hours. Alternatively, you can take a train. 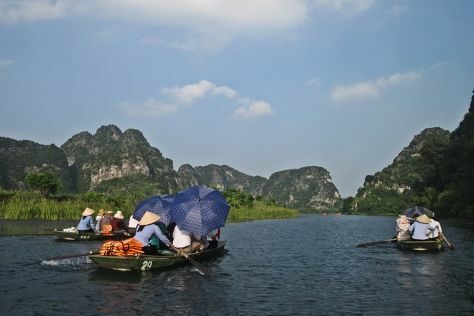 May in Ninh Binh sees daily highs of 38°C and lows of 29°C at night. Wrap up your sightseeing on the 26th (Sun) early enough to drive to Phong Nha-Ke Bang National Park. Bring the kids along to The Duck Stop and Phong Nha Botanic Garden. It doesn't end there: explore the fascinating underground world of Phong Nha Caves. For other places to visit, more things to do, ratings, and other tourist information, use the Phong Nha-Ke Bang National Park tour website . Traveling by car from Ninh Binh to Phong Nha-Ke Bang National Park takes 6 hours. Alternatively, you can do a combination of train, flight, taxi, and bus; or do a combination of train and taxi. Wrap up your sightseeing on the 29th (Wed) to allow time to drive to Hue. Kids will enjoy Nature & Wildlife Tours and Dam Chuon Huong Quan. Step out of Hue with an excursion to Ba Na Hills in Da Nang--about 2 hours away. There's still lots to do: contemplate the long history of Imperial City, contemplate in the serene atmosphere at The Mieu Temple, indulge in some culinary diversions at a local gastronomic tour, and make a trip to The Flag Tower. For where to stay, photos, traveler tips, and other tourist information, you can read our Hue online trip builder . You can drive from Phong Nha-Ke Bang National Park to Hue in 3 hours. Alternatively, you can take a bus; or do a combination of taxi and train. In May, daily temperatures in Hue can reach 40°C, while at night they dip to 28°C. Cap off your sightseeing on the 4th (Tue) early enough to go by car to Hoi An. Kids will appreciate attractions like An Bang Beach and Jack's Cat Cafe. Venture out of the city with trips to Da Nang (Da Nang Museum of Cham Sculpture, Dragon Bridge, & more) and Mỹ Sơn (in Duy Xuyen). Spend the 7th (Fri) on the water with a fishing tour. Make the 9th (Sun) an unforgettable day with an extreme tour. There's much more to do: make a trip to Hoi An Ancient Town, contemplate the long history of The Old House of Phun Hung, tour the pleasant surroundings at Cua Dai Beach, and explore the world behind art at Precious Heritage by Rehahn. 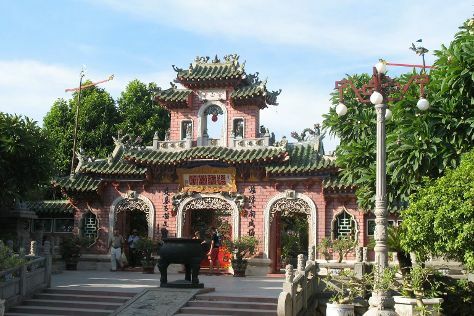 For other places to visit, more things to do, and tourist information, read Hoi An tour itinerary planner. Traveling by car from Hue to Hoi An takes 2 hours. Alternatively, you can do a combination of train and taxi; or take a bus. In June in Hoi An, expect temperatures between 41°C during the day and 30°C at night. Wrap up your sightseeing on the 12th (Wed) to allow time to travel to Nha Trang. You'll visit kid-friendly attractions like Vinpearl Land Nha Trang and Nha Trang Beach. Spend the 14th (Fri) among aquatic life with a scuba or snorkeling tour. Pack the 18th (Tue) with family-friendly diversions at Central Park. And it doesn't end there: take in the spiritual surroundings of Po Nagar Cham Towers, get a dose of the wild on a nature and wildlife tour, examine the collection at Alexandre Yersin Museum, and stop by Alco House. For where to stay, other places to visit, ratings, and other tourist information, go to the Nha Trang trip itinerary app . You can do a combination of taxi, flight, and shuttle from Hoi An to Nha Trang in 3 hours. Alternatively, you can do a combination of taxi, flight, and bus; or drive. Cap off your sightseeing on the 19th (Wed) early enough to go by car to Da Lat. Da Lat is known for nature, historic sites, parks, shopping, and nightlife. Your plan includes some of its best attractions: skim along the rocks with a canyoning and rapelling tour, take in the spiritual surroundings of Linh Phuoc Pagoda, contemplate the waterfront views at Xuan Huong Lake, and make a trip to Valley of Love. To find photos, where to stay, reviews, and other tourist information, refer to the Da Lat online itinerary planner . Traveling by car from Nha Trang to Da Lat takes 2.5 hours. Alternatively, you can take a bus. Cap off your sightseeing on the 25th (Tue) early enough to travel to Ho Chi Minh City. Family-friendly places like Dam Sen Water Park and Suoi Tien Theme Park will thrill your kids. On the 30th (Sun), spend a fun day on foot with Walking tours. The adventure continues: make a trip to Cu Chi Tunnels, relax and rejuvenate at some of the top local wellness centers, take an in-depth tour of War Remnants Museum, and take a stroll through Pham Ngu Lao Street. For traveler tips, maps, where to stay, and tourist information, go to the Ho Chi Minh City planner . Do a combination of taxi and flight from Da Lat to Ho Chi Minh City in 1.5 hours. Alternatively, you can drive; or do a combination of taxi and train. In June, daytime highs in Ho Chi Minh City are 38°C, while nighttime lows are 29°C. Finish your sightseeing early on the 2nd (Tue) so you can travel to Phu Quoc Island. Attractions like Sao Beach and Ong Lang Beach make great kid-friendly stops. The adventure continues: experience rural life at Phu Quoc Countryside, do some two-wheel cruising with Peppers in Phu Quoc chez Le Ho, don't miss a visit to Cao Dai Temple, and take in the exciting artwork at Phu Quoc Gallery of Contemporary Art (GoCA). To find maps, traveler tips, more things to do, and more tourist information, read our Phu Quoc Island online journey maker . Fly from Ho Chi Minh City to Phu Quoc Island in 1.5 hours. Alternatively, you can do a combination of bus and ferry; or take a bus. 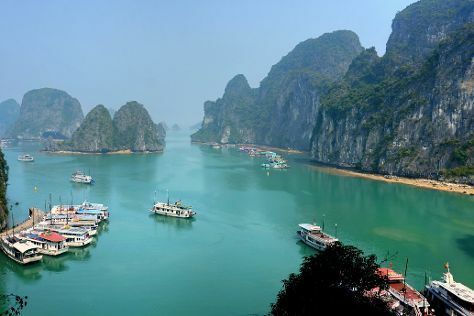 Wrap up your sightseeing on the 5th (Fri) to allow time to travel to Halong Bay. Attractions like Minh Chau beach and Sun World Ha Long Park make great kid-friendly stops. Explore the numerous day-trip ideas around Halong Bay: Cat Ba (Lan Ha Bay & Stand-Up Paddleboarding). There's lots more to do: contemplate the waterfront views at Hạ Long Bay, explore the fascinating underground world of Sung Sot Cave, step off the mainland to explore Hon Ga Choi Island, and tour the water at your own pace with Alisa Cruise. For maps, other places to visit, more things to do, and tourist information, refer to the Halong Bay trip itinerary planning site . Traveling by combination of flight and bus from Phu Quoc Island to Halong Bay takes 5 hours. Wrap up your sightseeing by early afternoon on the 10th (Wed) to allow time for travel back home.